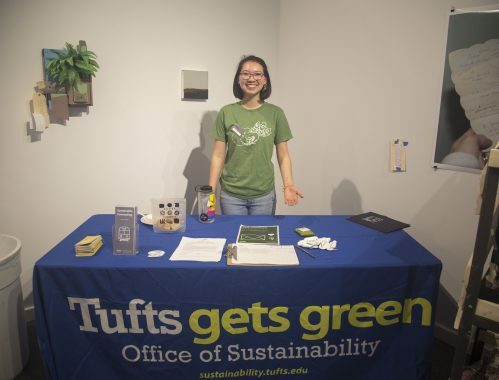 The Office of Sustainability has a presence at all of the employee and student orientation events across Tufts' four campuses as well as some of the accepted student days for prospective students. This is a great way to engage new members of the Tufts community from the get-go and introduce them to many of Tufts' sustainability initiatives and ways they can get involved with sustainability efforts on campus. These efforts help get new hires and students excited about sustainability as well as highlight sustainability as a key component of Tufts' campus culture. Our Education and Outreach Program Administrator attends almost 52 of the weekly New Hire Orientations throughout the year. All new Tufts employees learn about sustainability at the university as well as recycling practices to follow here on campus. The Eco-Ambassador program is also advertised, and new hires are all encouraged to participate. The Education and Outreach Program Administrator also attends graduate student orientations. 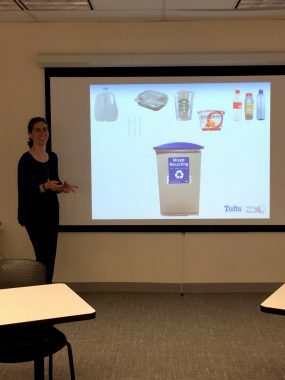 At the Friedman School for Nutrition Science and Policy and the School of Dental Health in particular, graduate students learn about sustainability initiatives at Tufts and best sustainability practices through a separate presentation that is a mandatory part of their orientation. 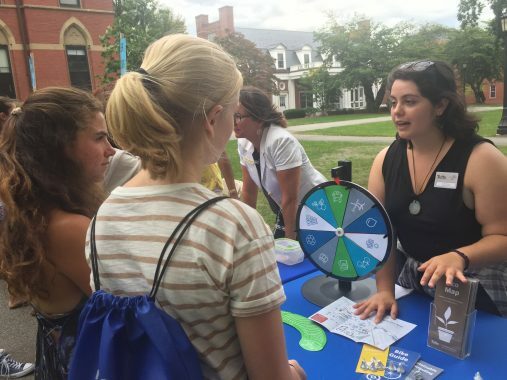 At these schools and others, OOS also tables at orientation events, handing out brochures and informing new students about the various commuting and other sustainability-related programs and benefits that are available to them as Tufts students. Some of the orientations, such as the Fletcher School of Law and Diplomacy's, are also zero-waste events, where all of the meals are consumed using wares and utensils that can be composted or recycled. OOS tables at undergraduate orientation on the Medford/Somerville campus every year. Current OOS interns help spread the word about the various resources available to them such as the Bike Guide and the Eco Map. In addition, new students learn about the programs they can participate in such as the Eco-Representatives program and OOS and recycling internships. The numerous clubs on campus that focus on sustainability-related issues such as Tufts Bikes and Students for Environmental Awareness are also advertised. There are often goodies such as snacks, stickers, and prizes up for grabs to further encourage participation and enthusiasm for sustainability initiatives here at Tufts. In 2018, Eco-Ambassadors from the SMFA campus applied for a grant to make their annual "Jumbo Day" for accepted students a greener event. With the grant funds, the Eco-Ambassadors purchased compostable plates, cups, and utensils. In addition, they had all of the attendees compost their leftover food, making it a zero waste event. The SMFA campus Eco-Rep also tabled at the event, handing out sustainability brochures and letting prospective students know about various commuter benefits available to SMFA students.